The second most injured body part in swimming is the low back. Many low back injuries are described as non-specific low back pain due to the complexity of the low back and many things causing low back stress. The spine being extended for long periods is extremely damaging to its structures. With the buoyancy of the board causing vertical stress on the arms, most swimmers backs are often extended while they are holding a board. Having the board closer to the body worsens the stress. This idea is not novel for many, therefore swimmers are instructed to kick with the board fully extended and have their head in the water. Unfortunately, this places the shoulder further into shoulder flexion, causing more issues for #3. The more dolphin kick practice swimmers do, the better their start will be underwater. The more dolphin kick they perform, the more power work they will do on their legs. Yes, swimmers could do easy dolphin kicks, but most perform aggressive dolphin kicks off the wall, even during long kick sets. I’m not sure why this is. Often, it’s to maximize the fastest swimming style, but the extra power work will improve their power off the block. So Kickboards are bad…what else is there? I’m glad you asked and made it this far. If you actually read this entire piece, you would’ve followed my train of thought for these recommendations, good work! Streamline dolphin kick: Dolphin kicking is the most important stroke. It is used in every stroke and is an essential part of elite swimming. If you replace board kicking with streamline kicking on your back and work 12 – 15 – m of dolphin kicks off each wall, your performance will improve! Moreover, you’ll remove most of the 10 items I listed above. Leg driven swimming: The best way to transfer a skill is to do it. Removing stroking from the equation minimizes the transference of the kicking to actual swimming kicking. 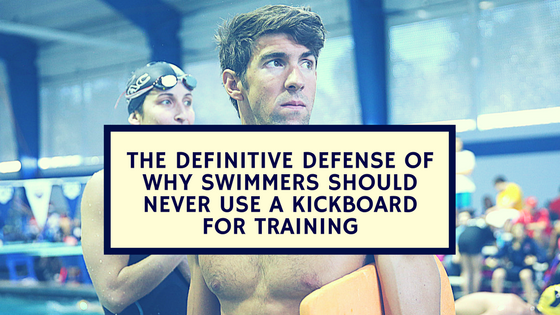 I believe this is why so many good board kickers are not good swimming kickers. Therefore, creating “kick sets” or leg driven swimming sets is a great way to give the arms a break, but emphasize the legs in a more specific manner. For example, have a swimmer swim with relaxed arms, with an 8-beat kick or ditch the kick count and do a maximal kick. This will certainly train the legs, won’t drain the arms (if the swimmer takes the arms easy) and remove the issues listed above. Yes, kickboards are a staple in the sport and help kids learn how to alternatively move their legs in the pool. They also teach young kids how to breathe and keep their head afloat. If you’re reading this, you aren’t in a learn-to-swim program. Don’t do something to follow mindless tradition. Break the trend, be healthier, and get faster at the same time! I know using a board is one of the few social aspects in the sport, particularly when you want social time, chat on the wall, or do a team activity. Take every chance in the pool for improvement opportunities! Improve with more leg-driven swimming and streamline kicking! Who is with me? Think I’m a fool, leave your comments and we can debate the point! As a Masters swimmer back into training after some years out of the pool i can totally concur with your statements. Im totally out of normal spinal position with the board and this gives me low back and neck strain with tension. I have analysed why and feel the flex in my spine which is not comfortable. Ive reduced kick with the board and the pain reduces. I ll try kick in sstreamline position and fly legs to see if that can provide the leg strength. I also came to this conclusion awhile back but you nailed it properly and in full detail. It takes wisdom and a progressive mind to improve things rather than sticking to tradition with no thought at all. Unfortunately, the club that I’m currently with (but not for long) has a very one dimensional way of swim training. Thank you! A great article summarising all my thoughts. I have not prescribed kickboard use for many years, it is not even on my list of equipment for my squad swimmers. After learn to swim for young children there is simply no need for them in my opinion. Teach the skills correctly from the start! Do you suggest kicking with the FINIS alignment kickboard, or no kick board? Snorkel? Thanks. Depends on what the athlete is working on. I think the alignment board is a helpful tool (as well as the snorkel) for finding streamline and core stability. However, for an entire set it is likely too much. While I do agree board kicking is bad, streamline is also terrible for shoulders. We had an orthopedic doctor tell us basically the only way to kick and avoid and added possibilities of added injury is kick with arms by your side. Yes, kicking with the arms at the side is the least stressful on the shoulder. I prefer to have them do stroking with an overkick than arms next to their side, as next to the side is a lot of drag and not specific to swimming (in my opinion). Jan Olbrecht would totally agree with you on kick transference and relates it back to how aerobic capacity is developed which is probably point #11: The specificity of building aerobic capacity dictates that strong kicks be developed using strong kicks in the full Swim effort. Well that was so informative and I guess the board usage explains my shoulder problem , and I’m getting a sway back from the kick board .im giving up the board !!!!! When I’m kicking on my front where should my arms go ? Same for back ? I underwent shoulder capsulitis surgery years ago and since the recovery I never used a traditional kickboard again (except for the FINIS alignment kickboard while having fun with a monofin). I use a frontal snorkel while training the kick: streamline position is OK and my shoulders are not stressed. You newsletter is very very full of useful information!!! I absolutely agree with your view. I’ve always been concerned with nullifying the functionality of the slings while using a board. Secondly, most races at a school level are won underwater, what do I mean.. in a 25m pool kids who start and tumble well have the upper hand.